It’s been a while since I’ve posted on here, so I thought post a quick update to let you know that I’m now on the Fediverse via Mastodon. Check out my About page for more information. A long time ago, in a decade far, far away, I dabbled with Linux on PowerPC hardware, specifically the PowerPC Macintoshes. After lots of trial and error, I was able to get Yellow Dog Linux and Mandrake running on a Power Mac 8600 and then on a beige Power Mac G3 at my old job. I also managed to get Debian installed on a Motorola StarMax 4000 MT which I still have in storage (if you’re not familiar with this model, it was a Power Macintosh clone from back in the mid-1990s). I even got Ubuntu running on my iMac G5 and boy did that distro run circles around OS X Leopard back in the day! That was the last Macintosh I would ever own before committing to Linux on the PC. However, a few months ago, I acquired two Power Macintoshes from someone I know. One is a Power Macintosh G4 “Sawtooth” which, unfortunately, won’t turn on (probably a bad power supply or a bad PRAM battery….or both). The other is a Power Macintosh G5. This particular G5 model is designated “Powermac7,3” which means it’s a dual 1.8 GHz G5 model with a NVIDIA GeForce FX 5200 Ultra AGP Pro card and PCI slots. It came to me with Leopard installed on the hard drive. Of course, a Linux geek like myself wouldn’t stand for this. Thus, I replaced the hard drive and attempted to revisit my Linux/ppc days of yore. Upon searching for a suitable Linux distribution, I quickly learned that support for the PowerPC was not as easy to come by in 2018. Most distributions stopped supporting PowerPC (ppc) and even PowerPC64 (ppc64) with the exception of little-endian PowerPC chips from IBM (ppc64el). While I did manage to find a Fedora ISO, it wouldn’t boot no matter what I tried. I eventually decided to go with tried-and-true Debian and, after a lot of searching, I came across the Debian Ports page which keeps unofficial ports of discontinued platforms. I downloaded the ISO for “sid” which is based on upcoming “buster” (v10) and burned it to a CD. Booting up from that CD on the Power Mac G5 and seeing the Yaboot prompt (Yaboot is a Linux boot loader for “NewWorld” Power Macs) brought back all those memories from my early Linux/ppc days! I went through the netinstall and, after a few failed attempts to boot and then creating an ext2 /boot partition after realizing that Yaboot doesn’t support ext4, I was finally able to boot the installed system…..until the screen went blank. Setting some kernel parameters to prevent this from happening allowed me to get the login prompt after it booted up, and I quickly began installing packages. I got tmux (a terminal multiplexer, shown above) installed as well as many other packages like Window Maker, Fluxbox, and even the MATE desktop environment which was my ultimate goal. After configuring my .xinitrc to load Xorg with a window manager / desktop environment, I ran startx and….it failed. Doing some investigation online led me to news that the NVIDIA card and nouveau on PowerPC were to blame, and that getting it to work might require recompiling the kernel to use 4K page addressing instead of the default 64K. My heart sunk. Nevertheless, I wasn’t going to quit so easily. After trying various changes to the kernel parameters and configuring device settings in Xorg.conf, my brain finally had an idea that was simple (and crazy) enough to actually work. See, I had my monitor connected to the G5 using a VGA-to-DVI adapter. After all of my failed attempts to get Xorg working, I decided to change out the VGA cable and adapter and use a dedicated DVI cable. I also changed the kernel parameters to use “nvidiafb”. After doing this, I rebooted the G5 and pessimistically ran “startx”. A gasp of joy came out of my mouth as I saw Window Maker start in all of its NeXTSTEP-ish glory! You can imagine the happy dance I did right after! I then configured .xinitrc to load MATE and, after managing to disable window compositing which would cause it to lock up the system, I was inside the MATE desktop and life was….OK. I say OK because I have come across some hiccups (as if you haven’t already noticed with all that I’ve mentioned so far). Pianobar and VLC crash with an “Illegal Instruction” message. Firefox ESR won’t last a minute before crashing, and the latest kernel upgrade from 4.16.5 to 4.17.6 caused the fans to run at full blast (something that I remember from my old iMac G5). Thankfully, after some more searching and comparing the modules loaded with the old kernel and the new kernel, I narrowed it down to the “windfarm” modules not loading on boot with the newer 4.17.6 kernel image. Running “modprobe windfarm_core” from the terminal tamed the fans once again. Not as straightforward as it was back in my early Linux/ppc days, but the Debian Ports maintainers for PowerPC do stress that we are running “sid”, aka “unstable”, and it is going to be unstable, so this behavior should be expected. I’ve tried to send a bug report to inform them of this, but ReportBug freezes the desktop when it tried to report the bug (adding insult to injury), so, for now, I’ve added the windfarm modules myself to /etc/modules as a workaround until they fix it. Even with all of these quirks, it was nice to get Linux running on PowerPC hardware again. And, if you do come across some old Power Macintosh hardware (preferably a G4 or G5) and some time to spare, you can give it a try for yourself. You’ll find all the information you need on the Debian Ports page and the latest ISO can be found here (select ppc64 for 64-bit Debian to run on G5 Macs or select powerpc for 32-bit Debian to run on any Power Mac including the G5). Once I have all (or at least most) of the kinks worked out, I hope to use this for some music production so I don’t have to rely so much on my Fedora laptop. I’ve got Qtractor, QjackCtl, and some DSSI soft synths installed and my Yamaha S08 synth is supported via USB for MIDI input, so I’m ready to rock and roll! Quite a while since my last post, so I figured I’d quench the thirst for some content. 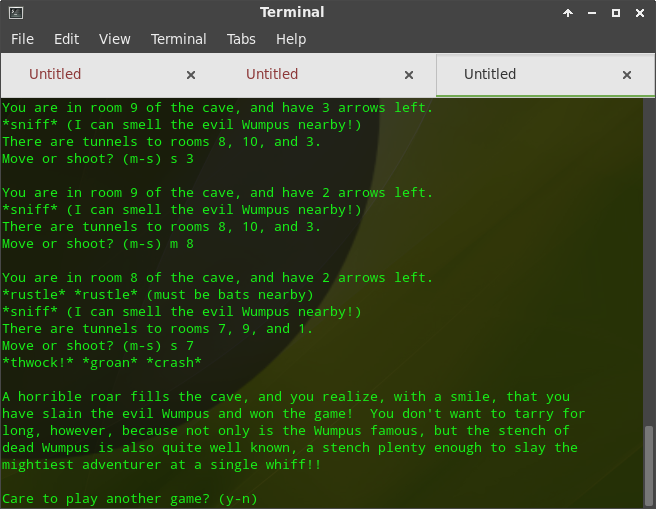 My last post was about playing old text adventure (aka, “interactive fiction”) games from days gone by on your latest hardware using interpreters like Frotz. This followup recording on Hacker Public Radio is on an Android application called Son of Hunky Punk. I discuss the history of SoHP and attempt to get my copy of Zork to work with it…..and I did. Following my post on Colossal Cave Adventure, I decided to record an episode based on my blog post for Hacker Public Radio (aka, “HPR”). If you don’t know what Hacker Public Radio is, click on the link below. In case you were wondering, anyone can record an episode for HPR and they are always in need of shows. While they tout topics that are “of interest to hackers“, anything you have to talk about will be of interest to someone so long as it’s nothing spammy. As for my episode, you can catch it here. I also have other episodes I’ve recorded on HPR which you can find by clicking on my name after clicking on the episode link. The Adventure Begins Again, and it Begins for Us! According to Raymond (aka “esr”), he was encouraged by Crowther and Woods (the original authors of Adventure) to polish up the code and ship it under an open source license. Esr gladly took on the task and, thus, Open Adventure was born. I intend to download the source code and build it to test out. As esr mentions, this isn’t the same version of Adventure that is provided in the bsdgames package available in basically all Unix-like operating system repositories. This is the actual code from the very last version of Adventure that Crowther and Woods released in 1995, so it’s quite updated from the bsdgames version. 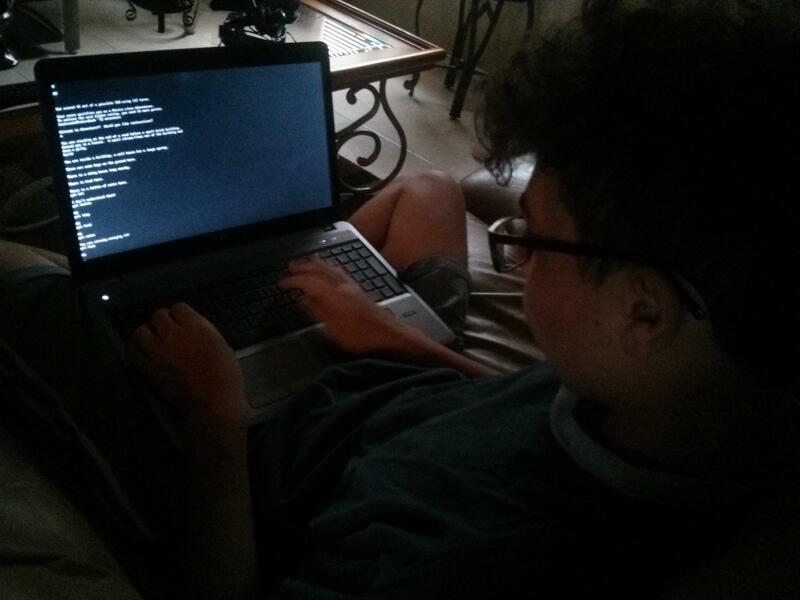 Nevertheless, I went ahead and installed bsdgames on my Fedora laptop this weekend with the intention of exposing my middle son to text adventure computer games. Before I go into this, a little bit of history on my personal experience with text adventure games. I grew up during the burgeoning home computer industry in the late 1970s and early 1980s. My introduction to computer-based text adventure games was at a friend’s house on her Commodore VIC-20. If I recall correctly, I believe it was called “Adventure 2: Pirate Cove”. Below is a YouTube video of its gameplay. Having been an Atari 2600 and Coleco-Vision kid (even though I did learn BASIC on a Commodore PET after school), I was quite intrigued by the gameplay. No graphics whatsoever…the graphics were all in your mind. Now, I was never one for reading, but this engaged me more than any book could. I was a big fan of interactive books, but this took the concept to a more dynamic level. I saw myself imagining what was being described in plain text and felt myself going through a range of emotions as my friend and I entered commands with unexpected results! Since then, I delved into similar games from Infocom and the like. I would be awake until the wee hours of the night engrossed in text adventure gameplay from when I had my Mattel Aquarius to when I upgraded to an Apple IIc. No typical video game could come close to the experience of a really good text adventure computer game. Time-hop forward to May 29, 2017: I’ve just installed bsdgames on my Fedora laptop and invited my middle son to have a sit-down and play Adventure with me. I even hit Alt-F2 to drop down to a console for the full text adventure experience! At first, he was a bit hesitant. 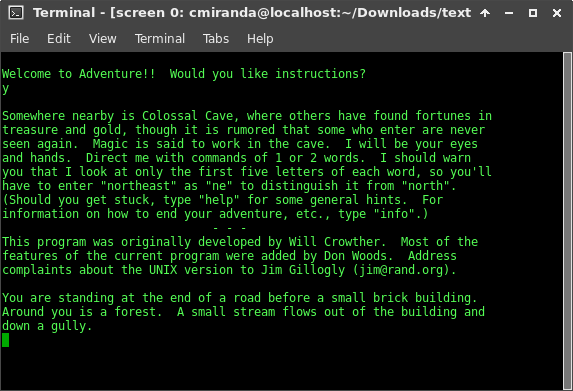 However, as time passed and as I showed him how to navigate within the game, I could see him slip into the world of the Colossal Cave and text adventures in general just as I did when I was his age! We both would go on this “adventure” and discover new ways of surpassing obstacles or die trying (a lot)….all the while having a great time together. After some time, he even took the laptop away from me to input commands and wouldn’t give it back! There was no doubt about it. He was hooked! That night, I had him install bsdgames on his laptop with a temporary Fedora installation and I’ve also installed it on the Fedora desktop at home. As of this morning when I spoke with him on the way to work, he told me that he couldn’t go to sleep thinking of how to get past some of the obstacles in Adventure and he’s already installed the Android port on his phone. I told him that I’d see about finding some other text adventure games like the Zork series from Infocom and others from that venerable company. Frotz is already installed on the laptop, so it’s time to find me some story files and test them out before we embark on our next (text) adventure! So, Spring Break has been upon me in in recent days and I’ve been relaxing and doing the things I love. 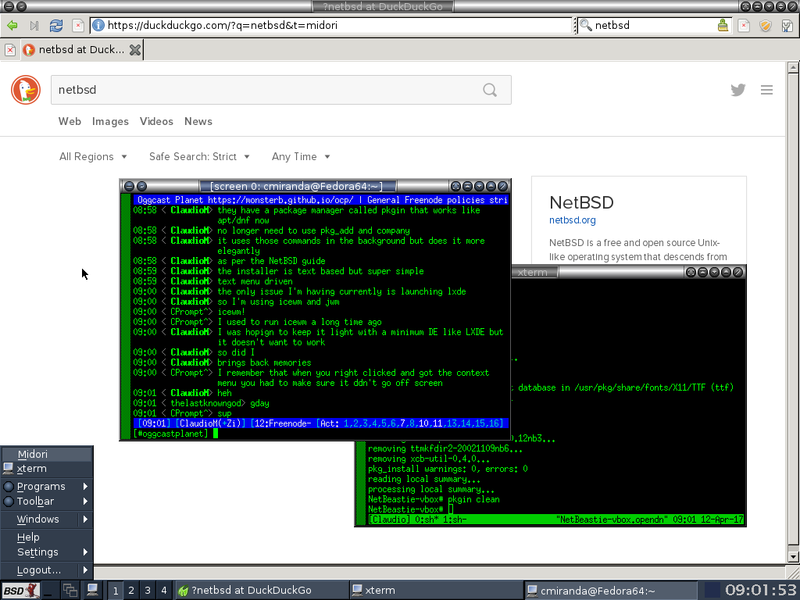 One of those things was download the recently-released NetBSD 7.1 ISO and install it as a guest VM in VirtualBox. The NetBSD logo, used with permission according to their logo usage guidelines. This time, though, I decided to install NetBSD 7.1 on a more worthy host system: the desktop PC I passed on to my kids (AMD Phenom II X4 965 Black Edition, 4 GB RAM, 1 TB hard drive, Fedora Linux 25 x86_64). I downloaded the ISO from the NetBSD website, configured VirtualBox, and began the installation. The installation itself is pretty straightforward. It is a text-based menu installer, similar to something like Windows XP or even FreeBSD’s bsdinstall, and definitely easier to follow than OpenBSD’s installer (though that’s not too hard if you pay attention during the installation process). After configuring my partitions (I just selected the defaults) and choosing what disk sets I wanted installed, I was off to the races. After the installation was complete and I finished some post-installation configurations (root password, new user creation, etc. ), I rebooted the VM and logged in. After logging in, I was presented with a shell, one that I configured right after it was installed. You have the choice of stock sh, csh, or ksh. I decided to stick with the stock sh shell and continue my system configurations from there on. One of the many things I liked about NetBSD was the new (at least to me) pkgin package manager. Apparently, it’s been around since version 6.x but I didn’t know about it until now when configuring my installation before rebooting to the installed OS. You have the option to use pkgin instead of the usual pkgsrc tools like pkg_add, pkg_delete, etc. Pkgin does a good job at being just like apt or yum/dnf for those still in the Linux world (specifically Debian/Ubuntu and CentOS/RedHat/Fedora, respectively). 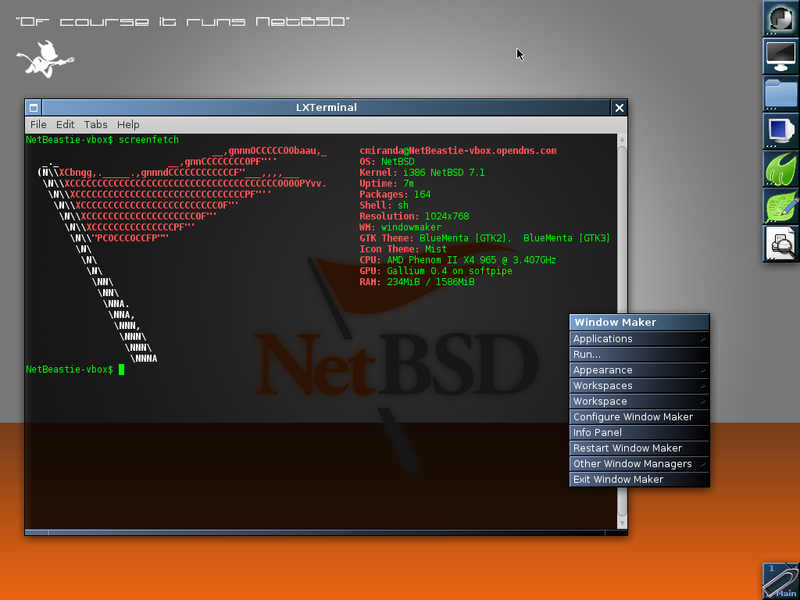 Thanks to pkgin, I was able to install many of the tools I use both in Linux and in FreeBSD. I had considered installing the tcsh shell (which I use in FreeBSD), but I decided to stick with what NetBSD provided me for the time being. Since Xorg was already installed from one of the disk sets during the installation process, I was already up and running with a GUI, albeit with twm as the window manager. Now, don’t get me wrong. I love twm and I have used it in the past since it’s the default once Xorg is installed, but it is a very basic window manager. I decided to install IceWM (for nostalgia) and I also installed JWM (Joe’s Window Manager) which I really liked. After a few tweaks to my .xinitrc file which I had to create in my home directory, each of them worked wonderfully and as expected. I also installed Midori so I could browse the web without resorting to my host OS. My NetBSD 7.1 VM running IceWM as the window manager and Midori for browsing the web. I also SSHed to my host OS so I could access my Irssi IRC sessions from within NetBSD. There were some niggles, though. As you can see, Midori is using the default “Raleigh” GTK+2 theme since I hadn’t set a preferred theme, and it’s ugly as sin. 🙂 I also tried running LXDE as my desktop environment, but I’d get an error saying that “it couldn’t connect” to some service when I configured it in my .xinitrc and ran startx (I imagine it might be some “Linuxism” that LXDE was looking for, but I’m not quite sure). Finally, Firefox was a bigger issue altogether. While I was able to install it using pkgin (latest version as of 2017-04-12 was 52.0.1), it would eventually crash when accessing certain website and the only way to get it somewhat working again was by deleting the .mozilla configuration directory. Even launching Firefox in safe mode wouldn’t stop it from crashing. Oddly enough, while the package repo for NetBSD identifies Firefox as “firefox-52.0.1”, the “About Firefox” option shows it as “Nightly” 52.0.1. I suspect this has a lot to do with why Firefox (or “Nightly” in this case) was so unstable. Needless to say, I uninstalled it (along with LXDE and other problematic packages) and stuck with Midori which was more stable here than it’s ever been in FreeBSD or even Linux. Hopefully, the NetBSD team will change this so that it upgrades to the stable rapid-release version of Firefox in the near future. My tricked-out NetBSD 7.1 installation running Window Maker. LXTerminal is using the BlueMenta them provided by the MATE Desktop themes package which goes well with the Window Maker style I had selected. Here’s a great interview by Bryan Lunduke with Haiku developer Augustin Cavalier. My Haiku installation on a Dell Optiplex GX620. What is Haiku? Well, watch the video in the link! Or, if you want to read more about it, check out the following links.